Caprese Pizza with Quinoa Crust is a simple, delicious, and healthier way to enjoy one of your favorite dinners! An easy dish that the whole family will love! Friday night is always pizza night in our house. Everyone looks forward to it, and gets excited to “make their own” variation. I am always trying to come up with new and creative ways to make our pizzas healthier, but still delicious so there will be no complaints! Quinoa is a staple around our house, and recently I set out to make this favorite of mine into a pizza crust. I was so pleasantly surprised with the results, that this will definitely become a variation that we will use often! I used caprese ingredients: mozzarella, tomatoes, fresh basil, arugula, and balsamic, but feel free to customize with your own favorite ingredients! The crust is pretty simple combining eggs, quinoa, fresh herbs, and parmesan cheese. The quinoa crust bakes to golden brown and holds up perfectly. The cheese and herb combination give the crust so much flavor! The quinoa also provides a complete protein and high fiber content that makes this a great dish for a meatless Monday. A few tricks that I would recommend in making this pizza. I always keep cooked quinoa on hand in my fridge. It makes a super easy addition to a salad for lunch, or a great replacement for rice. Usually I make a batch at the beginning of the week. 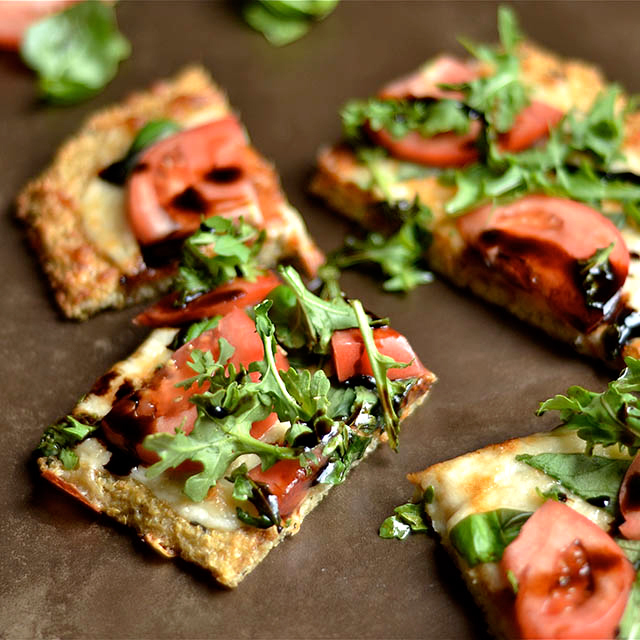 By having cooked quinoa ready to go, this pizza crust is so easy to throw together! With this pizza crust, it is best to serve and eat immediately. Although you can enjoy the leftovers, it tastes better fresh out of the oven! Preheat your oven to 425 degrees. Line a large baking sheet with parchment paper, set aside. Begin by preparing your quinoa. In a small saucepan, combine 1 cup quinoa seeds with 2 cups water or broth. Bring to a boil. Cover and reduce heat to low. Let simmer for 15-20 minutes, or until quinoa has absorbed the water and is fluffy. Set aside to cool. In a medium sized bowl, whisk together eggs, oil, herbs, baking powder, and garlic. Add in 2.5 cups quinoa (you will probably have leftover quinoa that can be refrigerated and used for another dish), and slowly fold in parmesan cheese. Mix until combined. Mixture should be thick, but wet. Spoon quinoa mixture across the parchment paper letting it shape into a circle or large rectangle about 1/4 – 1/2 inch thick. Pat down so the mixture is tightly packed. Bake for 18-20 minutes, or until the crust is golden brown on the edges, and firm to the touch. Remove from oven and top with mozzarella cheese. Return back to the oven for another 5-7 minutes or until cheese is melted and golden. 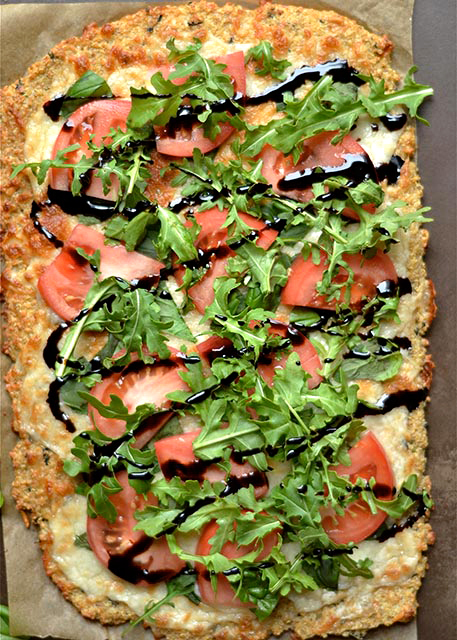 Remove from the oven, and top with sliced tomatoes, basil, arugula, and balsamic glaze (or toppings of your choice). Let cool for 5 minutes on the pan, then remove to a cutting board. Cut into small slices and serve immediately.